A 2 oz. 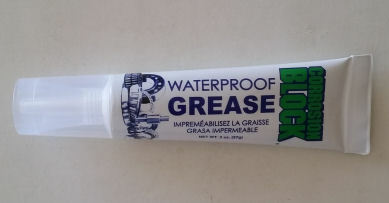 resealable tube of genuine Corrosion Block grease. Apply this superior grease to hundreds of items to not only lubricate, but to protect from corrosion. Use on wheel bearings, axles, boat trailers, boat lifts, garage door wheels, lawn & garden equipment and much, much more. This is super high quality grease that contains all the protective ingredients of Corrosion Block. Tube has a screw on-screw off resealable cap.